This site is dedicated to chip carving. 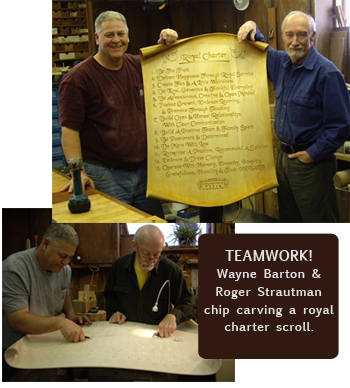 Wayne Barton is the master of chip carving and world renowned for his work and dedication of keeping chip carving alive. Mark DeCou is a truly multi talented artisan, which is what he calls himself but an artist would be a better word. No mater what Mark makes rest assured it will be made of quality that not many can achieve. If you are looking for carvings that are the ultimate in perfection then this is the place for you. His in-the-round human figures are breathtaking. If you like realistic carving then this site will be for you. Fraser makes realistic linens everything from quilts, coats, hats, and clothing. Bruce Alexander’s expertise is wildlife carving but he also excels at architectural carving. If custom work is what you are wanting then talk to Bruce. Nancy’s beautiful eye catching sculptures that combine abstract with realism are well thought out and carved. This is a great place to buy carving knives of all kinds. All of their knives are hand made to very high standards. This is also a great site for knife making information. The Woodcraft Shop has all your carving supplies and more. If you are in need of answers to your carving questions or just want feedback about your own work then this site and its many followers can help. There also is a live chat room that can be very helpful. This is another great place to go with carving questions.